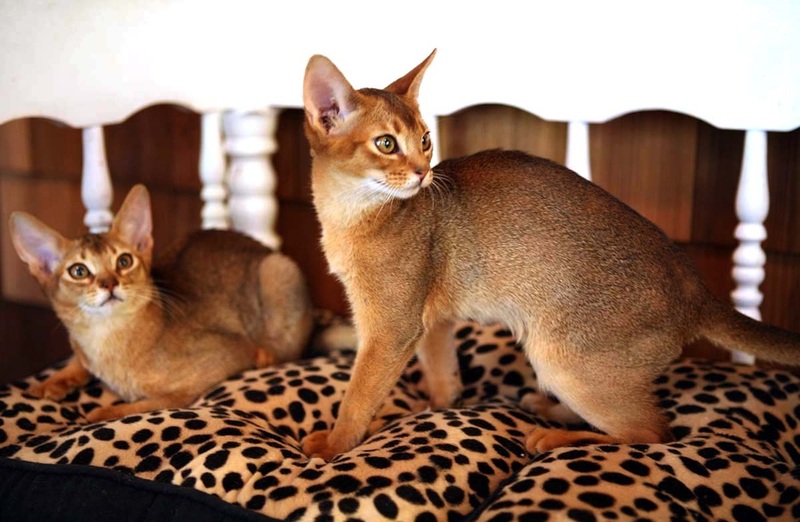 You can't get luckier as an Abyssinian breeder to see two bonded littermates go to the same home. Pegasus and Isis hit the jackpot as Mother and son team Karen and Todd each went home with a kitten... and since they live together, the kittens get to be together too! Yay!!! Isis getting out of the shower....Aby's in general love water....playing in the sink, shower, tongue lapping at water dripping from the faucet.... It's a good idea to have a water fountain for them to drink out of along wtih fresh water changed daily... I like the Drinkwell 360 Stainless Steel with its 4 separate streams of water to drink from. Just remember to keep them clean and change the filters when needed! Pegasus has a rather old school type of look, and one I especially love. Hre reminds me of my favorite aby of all time, T-Rex. The face is short, the ears are not as extreme as some, and the coloring neither dark nor light. Some of my aby's are more extreme than T-Rex was, and it is a pleasure to have gotten the look similar to the one I first fell in love with. Click here to see Abyssinian Kittens 2 litter.